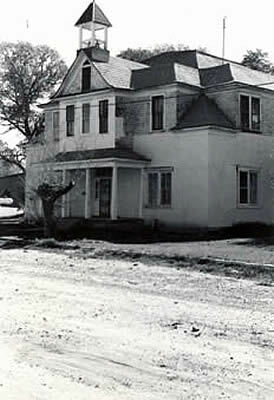 Baca House, Trinidad, an example of the Territorial Adobe style. Territorial Adobe buildings are most common in southern Colorado and date from approximately 1880 through the 1940s. These buildings were constructed using adobe blocks, yet have some elements of formal architectural style or are influenced by traditional or popular “Anglo-American” design. 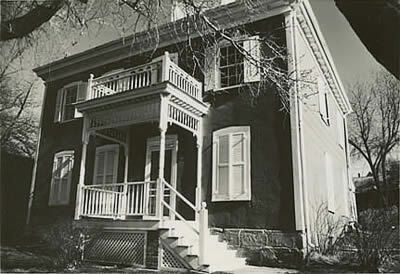 The earliest examples used elements of the Greek Revival, however, few of these survive in Colorado. 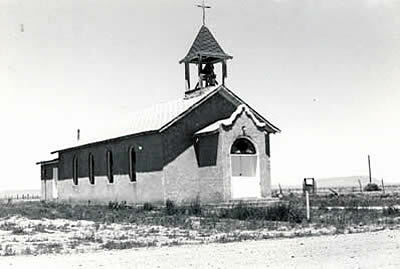 The Sacred Heart Mission in Garcia is an example of the Territorial Adobe type. Territorial Adobe buildings differ from earlier Hispanic Adobe construction in several ways. Hispanic Adobe buildings tended to have flat roofs while Territorial Adobe examples feature pitched roofs. The walls of Territorial Adobe buildings are thinner, measuring about ten to sixteen inches instead of the two to three feet walls of Hispanic Adobe buildings. Hispanic Adobe examples were built directly on the ground and Territorial Adobe buildings feature stone or cement foundations to protect the adobe from moisture. An example of the Territorial Adobe type in San Luis. The majority of anglicized adobe buildings used simple details such as gabled or gambrel roofs, false fronts or Gothic pointed arches. The most elaborate example of Territorial Adobe is the Baca House in Trinidad which features a few Italianate details.